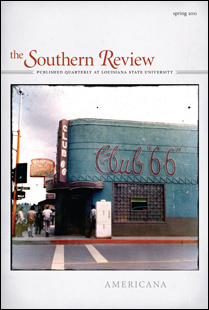 It’s short story month, and for my first post of the month I’ve chosen a story by Bonnie Jo Campbell in the latest issue of The Southern Review (Spring 2011). This is the issue that arrived in the mail just days after we heard the terrible news that the editor of TSR, Jeanne Leiby, had been killed in an automobile accident. The magazine has been sitting on my desk since it arrived. In “What There Was,” Campbell explores one of the dark sides of the circus—way darker than Cathy Day’s The Circus in Winter, which was already pretty dark. The focus here is on Buckeye, a young woman who is pregnant and has an appointment to have her third abortion. But she’s hesitating because she loves “Black Mike,” so called because he’s black and there are other Mikes in the troop. Mike seems fond of her, too, and daydreams about the baby they might have, although Buckeye tells him that if they do settle down together he’ll have to let her see him naked—it is a quirk of his that he always keeps himself covered. Red, an older man in the troop who looks out for Buckeye, insists that they must go; finally, reluctantly, Mike lets go of Buckeye and she leaves with Red. But they’ve not gone very far when she runs back to Mike. When he sees her, he slowly reveals what’s hidden under the shirt: horrific wounds and scars and needle marks. He’s saying, “This is what life with me would be like,” and she finally hears. The title of the story is vaguely reminiscent of the amazing Tim O’Brien story, “The Things They Carried,” and Campbell also uses repetition of the phrase in somewhat the way O’Brien does. The story begins, “There was the long silver whip of the circus train . . . there was pale-skinned Buckeye, a ditch-water blond . . .and Black Mike, skin as black as coffee.” And then, “Coming down the hallway there was Red . . .” and “There was Buckeye’s bare thigh pressing against Mike’s black-clad thigh.” And later, “There was Buckeye putting her finger to her lips . . .” And later, “There was Buckeye saying a kind of truth that felt nice.” And later, “There was Red standing before her . . .” and “. . . there was Buckeye walking out with Red, leaving Mike sitting on his bunk . . .” The effect of this litany of what there was is to make this dark portrait seem natural, inevitable. It’s just the way it was. That’s what was there. Nothing unusual in this girl who grew up in a household in which she was abused by the men in her mother’s life. Nothing unusual about Mike’s prison experience, his home-made tattoos, his scars, and his apparent self-destructiveness. Although Campbell does apparently let Buckeye see the light at the end of the story, or at least the truth about Mike, Buckeye lives in a world that isn’t real. Her own name is really Becky (and she’s from the Buckeye state, Ohio), but the name Becky is a common one, and she wishes it were Rosella, or Annabella, or Margerina, or Marmalada. She doesn’t like Mike’s name, either, and wishes he’d told the bosses that he was Mitch or Mick (“Those are white names,” he tells her). She also thinks Mitch would be a good name for their baby if it’s a boy (“That’s a name for a white kid,” he says). And if it’s a girl, she thinks they could give her a beautiful name, like Annabelle, or Mirabelle, or Belladonna, Donnamaria. Mike suggests “Mary,” after his mother, but Buckeye insists that a person needs to have her own name. Red’s name is an issue, too. At first Buckeye can’t remember what it is, but at the very end of the story, when she finally accepts Red’s help, she remembers his real name. There’s more here, too. Heat is a factor. In the train car where they live, pulled over on a siding in Phoenix, the heat is nearly unbearable. And when she shared an apartment back in Akron, Buckeye remembers that she couldn’t afford air-conditioning. She also imagines how happy Mike will be in air-conditioning. Yet she knows that staying in Phoenix with him could be a problem: “Being in heat like this all the time would make anybody crazy.” We get the feeling that Buckeye knows crazy, and maybe she sees it in Mike already. The story is a short one, but it’s filled with a lot to think about. >This is a great treat to learn about a new story by Bonnie Jo Campbell. She is a name to recognize and follow, and to read. I am one of her biggest fans. She has a new novel coming out in July, "Once Upon a River." But anyone who cares about short fiction who has not yet read "American Salvage," a finalist for the National Book Award in 2009, or her earlier collection, "Women and Other Animals," I urge you to seek them out. She lives in Michigan, as I do, and I have been lucky enough to hear her read and talk about writing at various conferences and appearances in the past few years. She is fantastic and a true inspiration. I am proud we are from the same state. Thanks for giving her this attention on your blog. I hope I will be able to get a copy of this magazine.